GULBARGA was known as 'KALBURGI' in former days which mean stony land in Kannada. Gulbarga district is situated in the northern part of Karnataka State. In the earlier days, Gulbarga was a district of Hyderabad Karnataka area and became a part of Karnataka State after re-organization of states. Recorded history of this district dates back to the 6th Century A.D. The Rashtrakutas gained control over the area but the Chalukyas regained their domain within a short period and regained supreme for over two hundred years. The Kalahari's who succeeded them ruled till the 12th Century AD. Around the close of the 12th century. The revolt of the Muslim officers appointed from Delhi resulted in founding of the Bahmani kingdom in 1347 AD, by Hassan Gangu who chose Gulbarga to be his capital. When the Bahmani dynasty came to an end, the kingdom broke up into five independent Sultanates and the present Gulbarga district came partly under Bidar and partly under Bijapur. With the conquest of the Deccan by Aurangezeb in the 17th century, Gulbarga passed back to the Mughal Empire. In the early part of the 18th century when Mughal Empire was declining Asaf Jha a general of Aurangzeb became independent and formed the Hyderabad State in which a major part of Gulbarga area was also included. In 1948 Hyderabad state became a part of Indian Union and in 1956, excluding two talukas which were annexed to Andhra Pradesh the remaining talukus of Gulbarga district became part of New Mysore State. Gulbarga is 613 Km north of Bangalore and well connected by road to Bijapur, Hyderabad and Bidar. Train from southern part of India to Mumbai and Delhi passes through Gulbarga. Shri Kshetra Gangapur an well known pilgrimage of God Shri Sadguru Dattarya is very close from Gulbarga.The climate of the district is generally dry and healthy with temperature ranging from 5c to 45c and an annual rainfall of about 750mm. The entire district is situated in Deccan Plateau and the general elevation ranges from 300 to 750 meters above MSL. Two main river, Krishna and Bhima, flow in the district. The predominant type of soil in the district is black soil. The district has a large number of tanks which in addition to the river irrigate the land. The Upper Krishna Project is major irrigational venture in the district. Jowar, groundnut, rice, and pulses are the main crops. Gulbarga an industrially backward district is presently showing signs of growth in the Cement, textile, leather and chemical industries sectors. 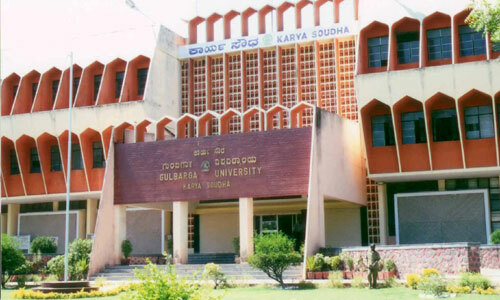 Gulbarga has a University with Medical and Engineering Colleges. This town was the Bahmani capital form 1347 until its transfer to bidar in 1428 Later the kingdom broke up into a number of smaler kingdoms - Bijapur, Bidar, berar, Ahmednager and Golconda. The last of these, Golconda, finally fell to Aurangzeb in 1687. Gulbarg's old moated fort is in a much teteriorated state, but it has a number of interesting buildings inside including the Jama Masjid, reputed tohave been built by a Moorish architect during the late 14th or early 15th century who imitated the great mosque in Cordoba, Spain. The mosque is unique in India, with a huge dome covering the whole area, four smaller ones at the corners, and 75 smaller still all the way around. The fort itself has 15 towers. Gulbarga also has a number of imposing tombs of Bahmani kings, a shrine to an important Muslim saint and the Sharana Basaveshwara Temple.